Did you know that there are more than 60 million sleep-deprived Americans? Seditol, an all natural combination of botanical extracts that produces muscle relaxation and calms an overactive mind in stressed individuals. Melatonin that synchronizes circadian rhythms to support healthy sleep. Magnesium Glycinate, a natural relaxing agent. 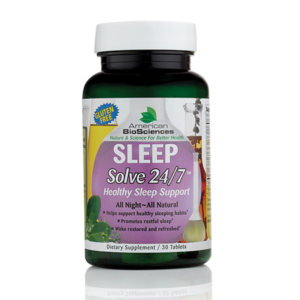 SLEEPSolve 24/7 works fast, is non-addictive, and has no drowsy side effects. You’ll wake refreshed and restored, ready to face the day! **There results are from an open-label human study of 302 participants taking Seditol. The study was conducted at the LaValle Metabolic Institute in Cincinnati, Ohio. Participants took one capsule every night for at least two weeks. Between stress, financial worries, and work pressures, people are spending too many hours tossing and turning. Getting a better night’s sleep is becoming a priority, and more and more people are looking for a natural, non-habit forming sleep aid solution. You relax so falling asleep at bedtime is a snap and you wake renewed and refreshed. One hour before bed, take 1 tablet (for added benefit, 2 tablets). Allow for 7–9 hours of sleep. May take up to 7-10 days to achieve full benefit. Keep out of reach of children. Do not use if you are hypersensitive to any ingredient in this formula. Consult with a physician prior to use of this product if you are pregnant, nursing, or have any existing medical condition. May cause drowsiness. Alcohol may intensify the effect. 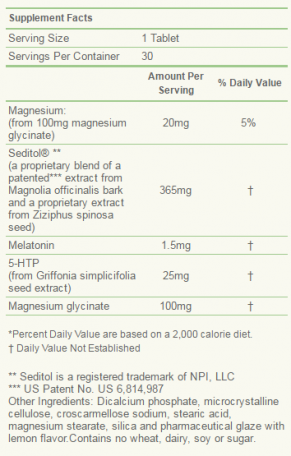 Click here for seditol (magnolia bark and ziziphus seed) research.